When I was very young, perhaps 4 or so before we left for Brazil, I went out with my sister and her friend Michael in a Rowboat at Rockaway Beach in Queens, NY Shity. We got caught by a rip tide and Michael had to get us rowed back into shore. He managed it, but what took only around 20 minutes to get offshore took probably 4 hours for him to get us back to the pier. I was scared out of my wits, I remember that well. We sang "Micheal Row Your Boat ashore" probably a 100 times. Mostly we remember Pete Seeger as an Old Man. But Pete was an amazing and captivating performer when he was young. Remember also, this was the time Pete was called before the Army-McCarthy hearings and was Blacklisted in the Communist Purge. Tell me again there was ever a time Amerika wasn't a Fascist State. I dare you. I never went offshore in a rowboat again after that. These guys were just nuts. 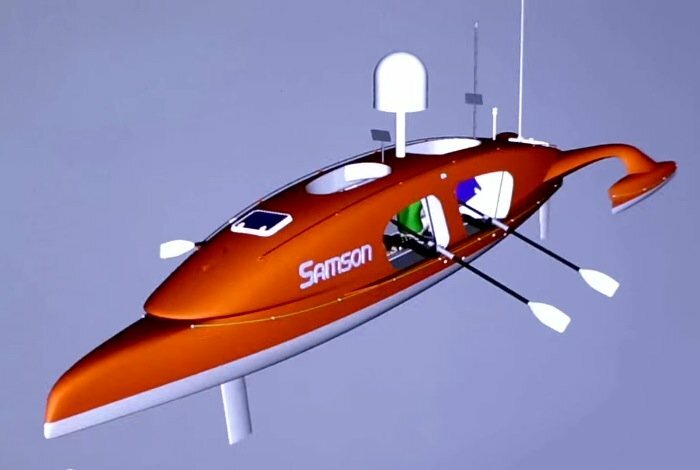 Experienced rower Andras Bakos and his teammate are currently in the final preparations to row across the Atlantic in a specially designed rowboat called The Samson. The Samson has been in development since 2011 and has been built in conjunction with LOMOcean Design, the design firm that also helped designed and created the TURANOR PlanetSolar solar-powered yacht, and the Earthrace alternative fuel-powered boat. The Samson measures 13.4 x 2.9 meters in size and has a dry weight of 650 kg, but fully laden with all the supplies the team will require for the Trans-Atlantic crossing the boat weighs in at 1.2 tonnes. The rowboat is not equipped with any motors or sales and relies entirely on the two rowing stations and its crew for propulsion. For more information on the new Trans Atlantic crossing and the futuristic boat the team will use watch the video below or jump over to the official or Indiegogo website for details. I have been experimenting a lot with Candle Making and with Oil Lamps lately, it's my new Collapse Prepping hobby. I'm going to write further articles and make more videos on this topic, but I ran across this Utoob vid while researching how much heat you can get out of candles and lamps as emergency heating and lighting sources. This Seasteader uses an Aladdin Oil Lamp which I think he fires with Kero, which comes in about 1/4 the price of Liquid Paraffin. It's a dirtier fuel though, and a bit stinky. Paraffin burns much cleaner and there is no smell unless of course you add a scent to your mixture. Aroma Therapy is supposed to be very soothing and good for your state of mind, although for me I find just watching the fire burn is soothing enough. His result with 1 lamp burning raised his cabin temp from 10C to 21C. Looks like about a 30' Seastead. I'm going to experiment in SaVANnah over the winter to see what it will take to make the cabin space comfortable. This is an ugly boat that has some beautiful things about it. It is one of those old style CCA rule boats that is small inside for it's length. But it's big enough to be a nice liveaboard. It's for sale in Houston for $8000. Not a bad price in my view. They built so many of these Columbias in the early days of mass boat manufacturing, there are lots of them out there, and I've been aboard a couple. They were mostly designed by a guy named Bill Tripp. What I like about them (even the small ones under 30 feet) is that they are built for people to be comfortable in. They all have standing headroom. They have nice berths. They have small but well laid out galleys. This 41 footer is NOT a walkover. I expect what this boat needs is just some updated rigging and sails and electronics. Some of these boats get some soft spots in their deck cores, but they are easier to fix than some fancy teak decked upscale yacht, which have decks that need to be ripped completely off and rebuilt. I like that swim platform add-on. Great for diving. It's for sale in Houston for $8000. Not bad price in my view. Great price! Right size also for comfortable live aboard. When RE says the price is great, the price is GREAT! LOL. I doubt it's ready to go offshore, but it looks like a nice boat, if you aren't too hung up on looks. For that price, I got no problem with ugly. Ad doesn't say how many hours are on the engine though, or what the fuel and water storage capacity is. Not planning to go offshore even if the legs are miraculously repaired, just coastal sailing around Bar Harbor. Would have to get the boat up there though. 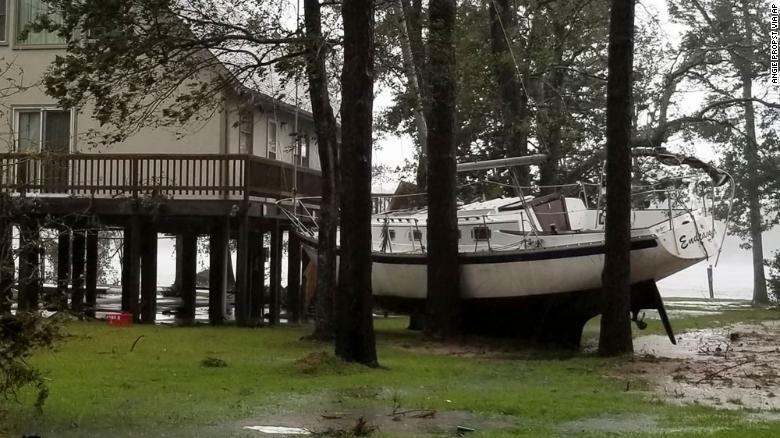 There is a reason old boats end up in Texas. It isn't a slam dunk to sail east and north. You can do it, but it takes time, which people tend to not have an excess of these days. Almost always better to buy a boat either near where you want to be...or somewhere that it easy to sail towards. Since my fantasies lean toward the Caribbean, from BVI to the east and central America to the west, a boat found in Texas is good..and I can use it on weekends until the day I sail off into the sunset, when and if...and if I don't 8K wouldn't break the bank. The slip, and making sure the boat is kept clean and in usable condition, is the hard part anyway. I can look at that boat and already think of some cool things I could do to make it better without spending a lot....which makes looking at it dangerous. Nice boat for the money. Gotta hope no more Hurricanes hit Houston until you are ready to sail into the sunset. Also, gotta put in Air Conditioning down there. ALL those places are exposed to storms and AC is necessary, at least at dockside. Insurance is a cost of boat ownership, as long as BAU persists. I lean toward buying a boat in Florida or Mobile and sailing it here. That one sail would be a worthy adventure, and I only plan to buy one more big boat (if that), so it makes the best sense to me to try to buy something I really love, vs. some kind of compromise that needs a lot of work. Right now the selection there is better than the selection here. None of this will happen unless I sell the stead or have some kind of unforeseen financial windfall. But I have a feeling it might happen. I'm not obsessing about it. The Titanic is under construction again - at least a replica of the famous ship - 105 years after the original passenger liner sank on its maiden voyage from Southampton in England to New York City, reported TVNZ. Titanic II is scheduled to set sail in 2022 and will retrace the original ship’s route, USA Today reports. The project was first announced in 2012, but was put on hold after a financial dispute. Now that the issue has been resolved, Blue Star Line has announced construction has re-started. What a GREAT idea! Only an Arab Sheik could exhibit such genius! So...some people think that there might be more rather than fewer icebergs to dodge now. I'm way too superstitious to book a crossing on a ship named after the world's most famous shipwreck, one that is bound and determined to try to sail the very same route, at a time when both ice and weather are more random than they were in 1912. God has a great sense of humor. Maybe this time a giant methane bubble will come up from below the ship and pop.....the Titanic II will fall thousands of feet to the bottom, while the passengers are being asphyxiated by the methane. Then the ship will break up and explode when the wreck ignites the gas. No thank you. I'd rather kayak across.